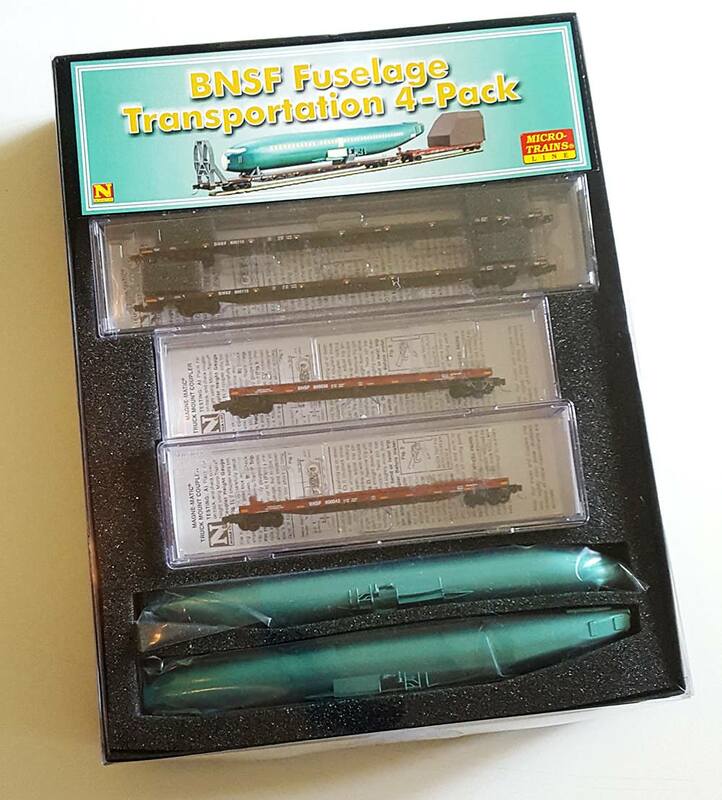 The Micro-Trains BNSF Fuselage sets kits are starting to appear! I grabbed the first one I could find and am very excited! We knew it was going to be a good looking model from the marketing photos, and that there would be some user-applied decals as well. Additionally, the Ice-Breaker and mounts come still embedded in the 3D printed spruce tree and requires removal and cleanup. At this point, I was too excited to get things on the layout for a test run, so I hurried through this task. With 3D printed parts, I of all people should have known better not to hurry, and broke off a strut on one of the Ice-Breakers. Not to worry, a dab of CA fixed it firmly back into place. The Ice-Breakers slide down over the flatcar sill. In MT photos, they just remove the upper grab-irons, but I found you can also use them to hold the Ice-Breaker in place. You'll want to use fine tweezers and remove one of the grab-irons, slip the Ice-Breaker down into place over the other iron, then re-install the grab-iron over top of the nub on the Ice-Breaker, twisting the iron out from the inside. You can kind of see in the below photo. I would not recommend trying to pry the ice-Breaker feet over the grab-irons in place as you'll risk breaking the 3D printed part. Another thing to note, the front mount properly has a taper to follow the shape of the fuselage nose, but of course it is very subtle so I scratched an arrow into the bottom. So here we are! All parts separated and cleaned, minus decals. The third fuselage in the back is my 1:144 build. Wow, that color is identical! As sloppy and out of scale my build in the back is, I always have it sit out in the yard at our shows and it always grabs attention. 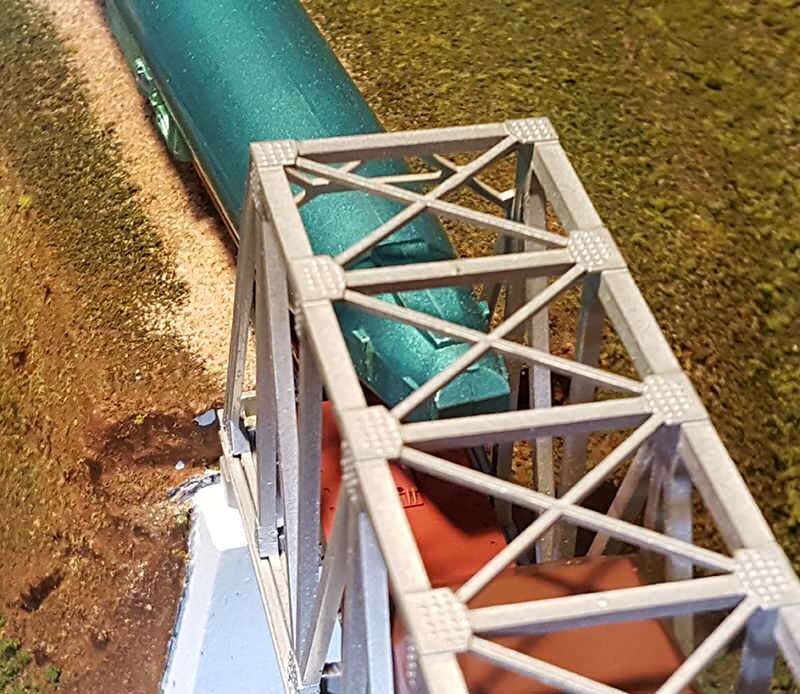 Unfortunately, being 1:144 scale, it cannot fit through an N Scale Truss, and it's a bit hazardous to adjacent tracks on curves, so it never gets to move. Cue the layout test for MT's Set; just barely, but it's a pass!! 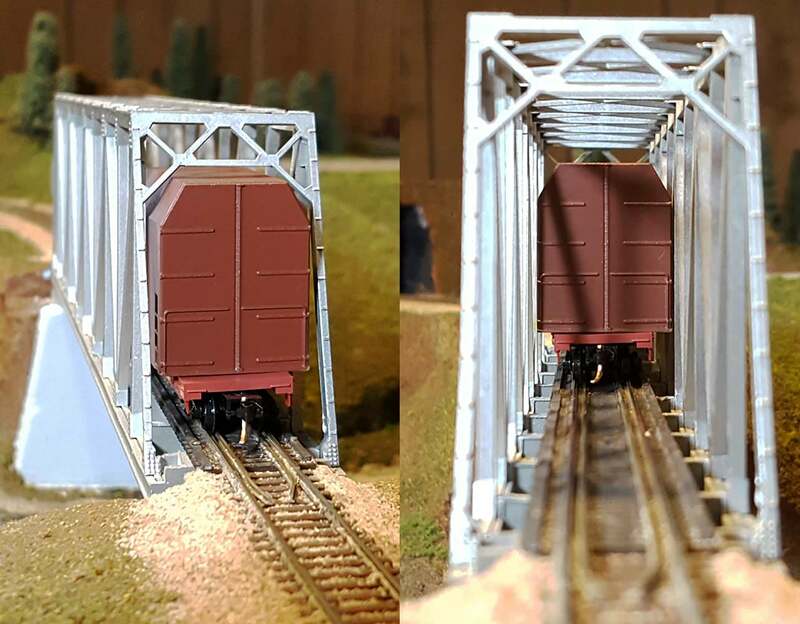 You'll probably want a slow-order through bridges and tunnels, but it'll make it! There's a lot of stuff going on on a prototype Fuselage load. 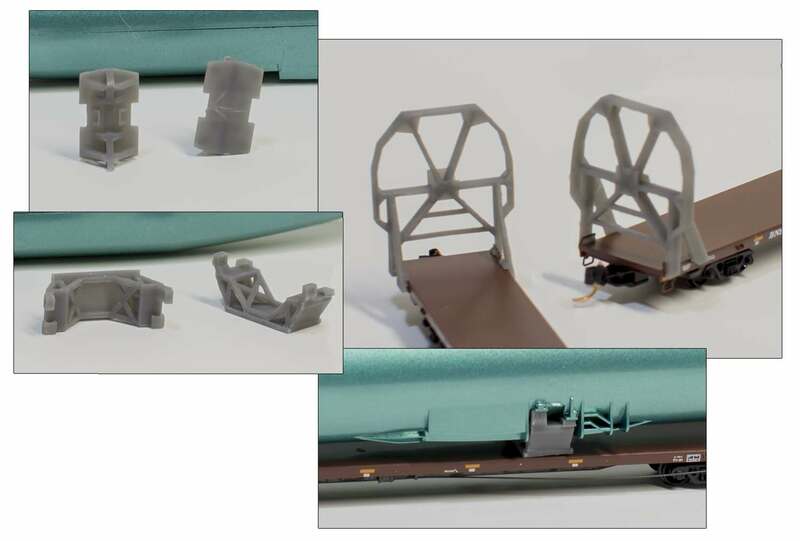 The MT Set provides just a basic decal sheet for windows, doors, nose, and wing, to be applied on a solid green fuselage. I would say that satisfies representing the prototype at the most basic level (and I'm sure it was a major factor in keeping the set price very attractive). But comparing with the prototype, we have a lot of quite simple additions we can make to take this even further! 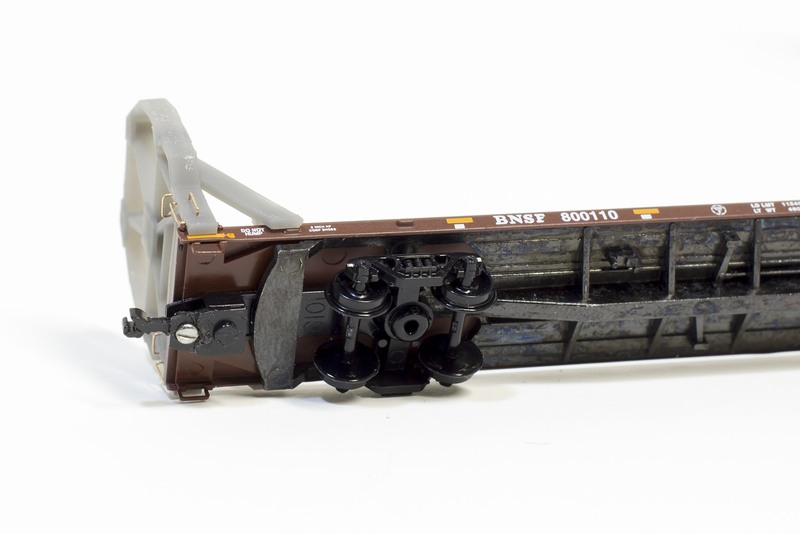 I'm starting off with the whole wing port, tail mounts, and front wheel housing, which will be painted appropriately. White for the front wheel port, and I found a "Bug Yellow" spray at the hobby store that appeared to match the wing ports quite well. 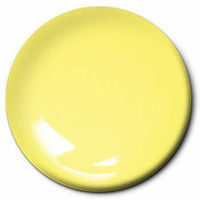 Well, I'm not so sure about the yellow after-all. Its a little less vibrant in person, but still a bit brighter than I hoped. I've since masked and painted the tail wing boxes black, which is drying now. Back to studying video while I wait for the next update. *****FOLLOWING***** Mark, your Off to a Good Start. I have a set ordered. Something to think about, as far as the 1:144 version... 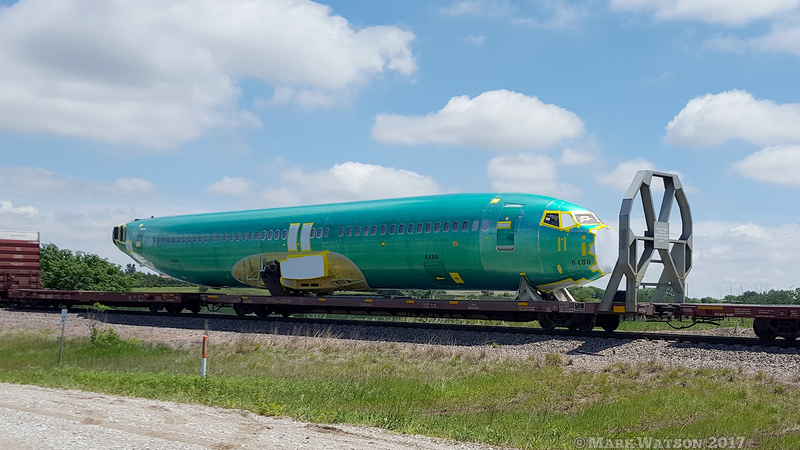 The 737 fuselage has multiple lengths, width is fairly consistent. These are going to look great when you all add the extra details. 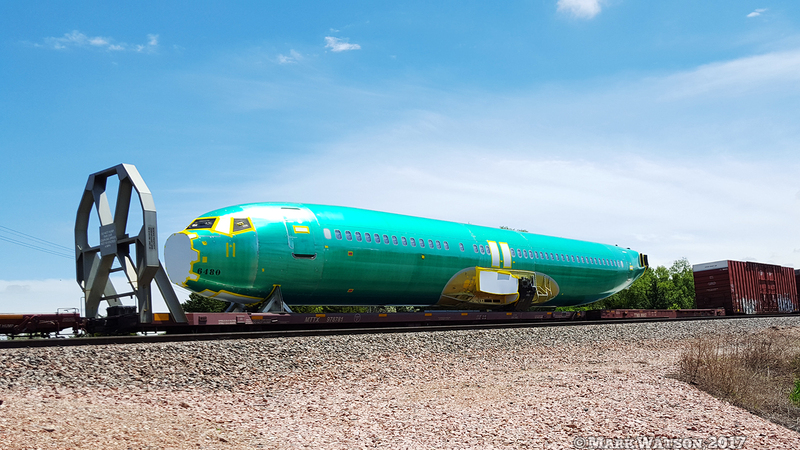 Thanks, I'll look for those colors when I mask up the second and more fuselages. Re: 1:144 model, unfortunately it's the width that causes the issues. If you have completely straight runs into bridges/tunnels it could run fine, but in my case there's an easement leading into the truss bridge, making it a no go, no matter the length. Ok, here it is with the tail wing boxes and the middle mounts painted black, roughly as seen in pictures and video. I think at this point I'm ready for the included decals on the fuselage. The ice breaker and front mount still need a coat of gray, then to decide how to spice up the tail component box too. Very nice, thanks for the tips and the video. Mine came yesterday and I haven't had a chance to open the box yet. Looking forward to this model. Very nice Mark. 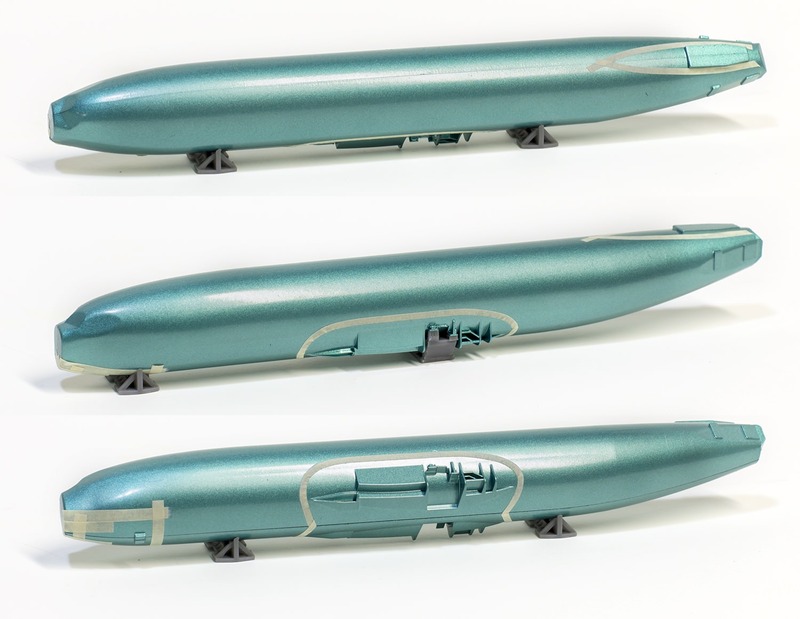 Would you mind sharing what brand and color of green you used on your 1:144 model ? 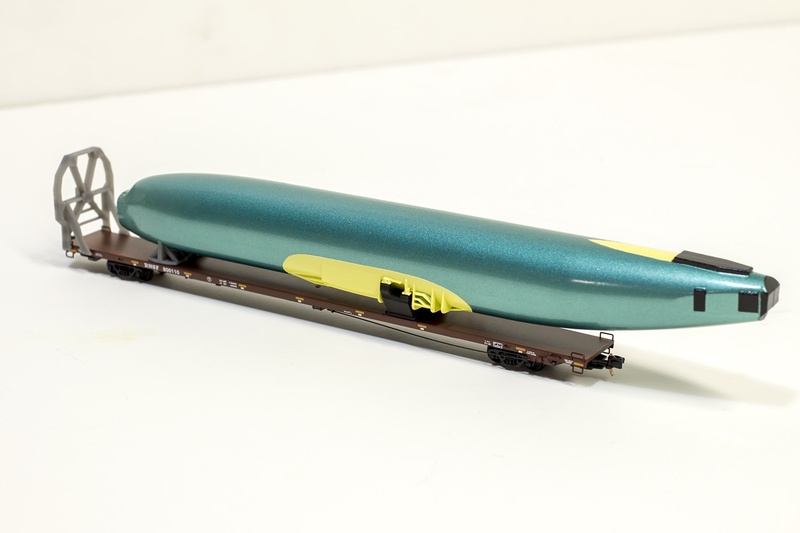 I have a 3D printed plane to paint. BTW, I finished my blade train and it runs perfectly on our club layout. I am going to get a video put together soon. I am currently helping my wife (home care?) rehab a total knee replacement, done 10 days ago. Best wishes with the rehab. I'll look forward to the video. I know I used these colors, but I'm not sure which order. I think it was a base coat with the Sea Glass, followed by a coat of Jade Tint (translucent), and finally a dusting of Metallic Turquoise. I should have re-read it before trying that Bug Yellow on the wing port. Starting to have fun now! 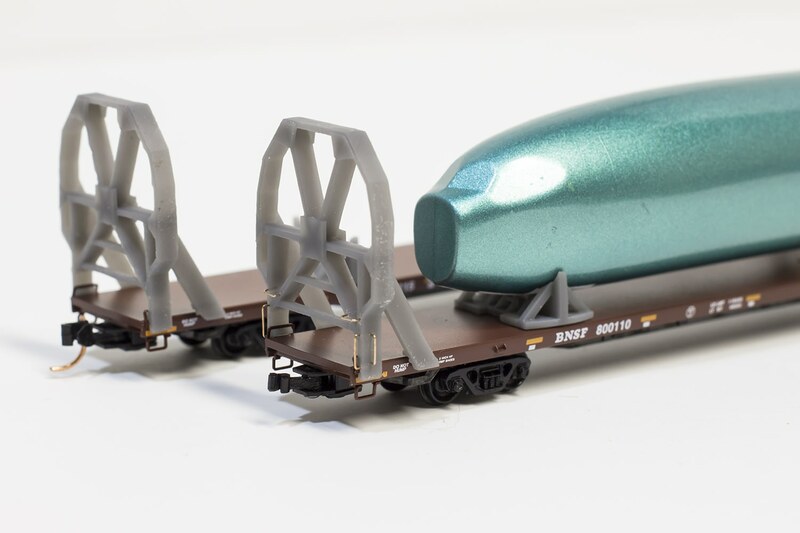 Grab irons and True-Scale couplers. Next thing that stands out is the thick base on the front mount plate. I'll be sanding that down and adding another slight tweak before painting. I removed the N coupler from the housing and drilled a hole for the True-Scale. This way if something doesn't work out, I can re-install the N coupler as if nothing was changed. You can always say that there was an accident along the normal route and an alternate had to be found. This next part may not be for the faint of heart. 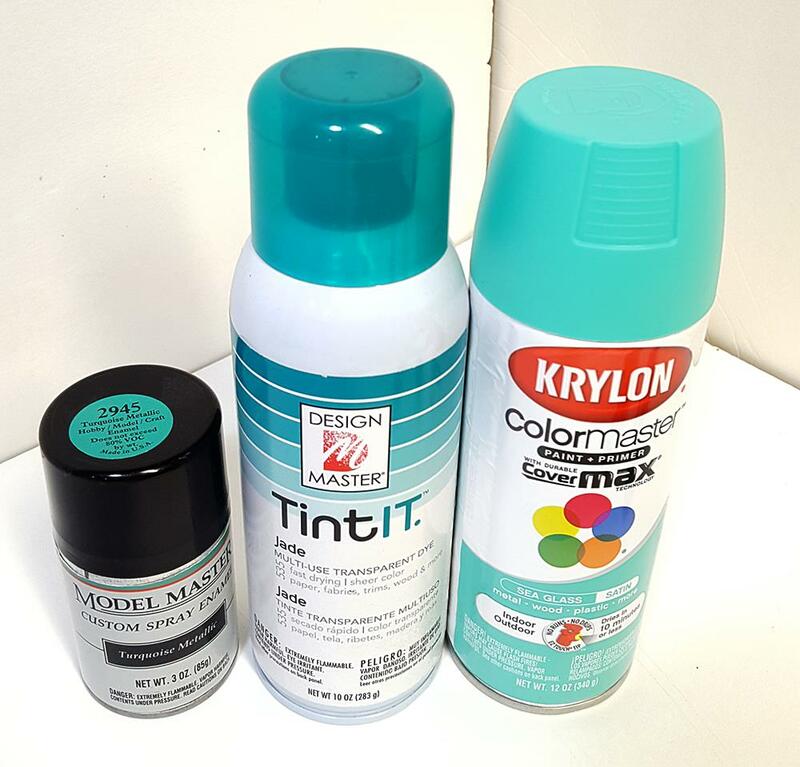 Let's take a look at the green paint. Like the rest of the kit, it does a good job of the general look and feel of these loads. But up close its very very.... glittery. Looking at the prototype; no glitter, and actually quite streaky. I realize the limitations of scale metallic paint, but let's try an experiment. I dipped a small brush in paint thinner, dabbed it on a paper towel, then wiped the paper towel with multiple very light pressure passes. I'm quite impressed by the result! Oh, and definitely something to do BEFORE painting the other parts next time.